When it comes to beauty, I tend to be attracted to the beautiful packaging and luxurious textures of high-end products, I'm sure you have noticed. But I also love the thrill of finding a hidden gem at the drugstore, one of those rare, outstanding products you can get for a handful of nickels! NYC's nail mattifying top coat, Matte Me Crazy, is one of these drugstore beauty heroes you can enjoy without breaking the piggy bank. With a price tag of only $1.99 at my local drugstore, I wasn't expecting much from this little bottle when I bought it a year ago, but I thought it was a good, inexpensive way to try the matte nail trend at home. I was almost anticipating it to be thick, goopy and hard to work with - characteristics that have been common to basically all the matte nail lacquers I had tried, even from reputable brands - and boy was I proved wrong. Nail polish doesn't blow my mind very often, but this little affordable guy did! 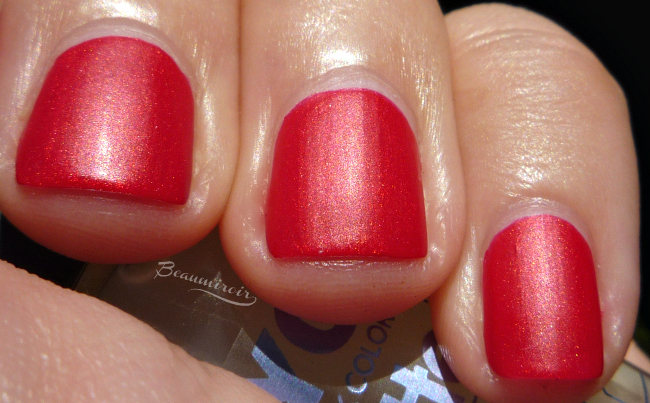 First, I love the concept of a matte top coat: you can apply it to any nail polish to give it a matte finish. No need to invest in a whole new bunch of matte nail lacquers when you can simply turn any polish into a matte! NYC Matte Me Crazy does that job beautifully. It dries to a true matte finish, with a kind of velvety quality that prevents it from looking completely flat and boring. While it looks milky in the bottle and does lighten the base color just a little bit, it doesn't make it dull or less vibrant. But the really amazing thing about this $2 top coat is the perfection of its texture. It flows on the nail easily without pooling on the sides or sticking to the polish underneath and it self-levels immediately for a completely streak-free finish. It dries within seconds, literally, to a smooth, soft matte result. I'd say it dries about 10 times faster than my favorite fast-drying top coat by Sally Hansen! I think it looks particularly interesting when used on top of a shimmery lacquer, creating a sort of matte frosty look. On the pictures here I'm wearing it on top of a discontinued limited edition nail lacquer by Dior called Merveille, which is a glossy warm red with gold shimmer. 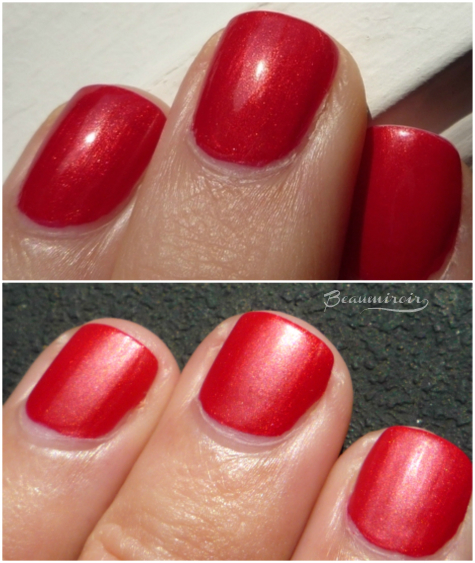 By the way, this nail polish was the subject of my very first post on my English-language blog in 2012! NYC Matte Me Crazy is not a long-wear top coat: my nail lacquers chip a bit faster than they would if just applied by themselves. I have the same experience with matte nail polishes in general, which rarely last more than 24 hours before starting to chip on me. So mattes in general are great for an event or party, but you can't expect to wear them for much more than a day. 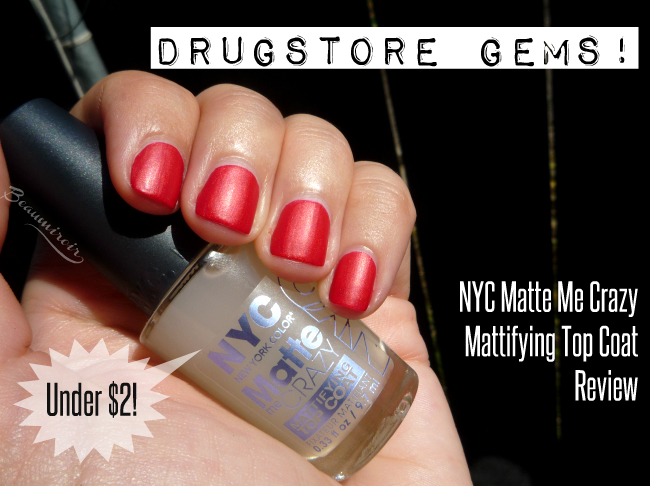 NYC Matte Me Crazy may be dirty cheap, but it's a high-quality mattifying top coat that will turn any of your nail lacquers into a matte color. For $2 you get a perfect texture, foolproof application and a flawless finish! Do you like matte nails? Do you prefer to buy a matte nail lacquer or a top coat to use with any polish? At your local drugstore or anywhere you usually find NYC. It's a bit hard to trace online (you sometimes see it for a ridiculously inflated price on Amazon or Ebay) but right now it's available at Target.